The geometric abstract work of Henriëtte van ’t Hoog often makes you lose your balance. 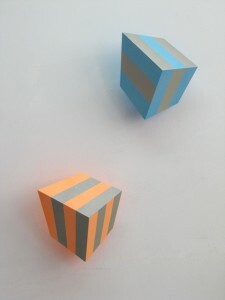 She plays with the perspective of cube-like forms, with their three-dimensionality, their colour and light. When you walk along these objects, their forms change, their perspective collapses. The reflecting paint on the back of the object radiates its colour on the wall. The reflection emphasises its spatiality and gives the thing a poetic annotation. Consequently, the work of Henriëtte van ’t Hoog is at the same time concrete and not concrete. From the catalogue FutureShock OneTwo, galerie dr. julius | ap, Berlin 2011.